A Delray Beach eatery is now turning a new sweet twist in the CBD craze. DELRAY BEACH, Fla. — A Delray Beach eatery is now turning a new sweet twist in the CBD craze. 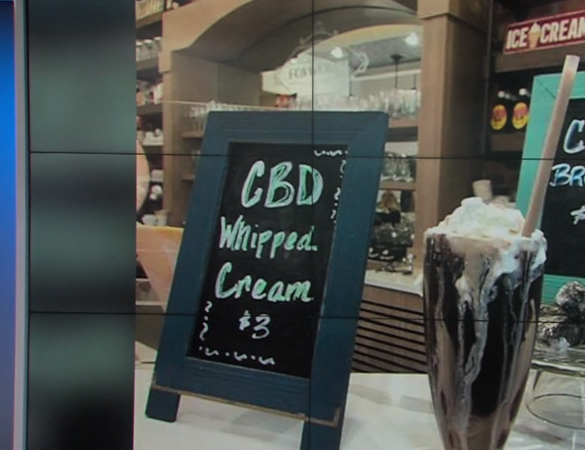 "We're putting it in a milk shake, we have a milk shake called the daddy chill out, it's a mint chocolate flavored ice cream with mint chocolate flavored CBD oil,” says TJ Dildine a pharmacist at Delray Shores Pharmacy and the Foxworth Fountain. Also on the menu are CBD brownies and whipped cream, along with other ice cream floats. "It helps with pain. It helps with inflammation and the anxiety,” says Rose Marie Celesti who makes the drive from Hollywood to order the floats. "They taste just like a chocolate milkshake, you don't get high it's nothing like that,” Celesti says. Recently legalized by Congress, word of mouth is crediting CBD with offering relief to some chronic pain.